Every month I am excited to see whether any of my designs have been chosen to feature in the latest Wedding Ideas Magazine - it is always a great way to share Designed to Sparkle wedding jewellery with new brides to be, maybe even those just starting out on the exciting journey of wedding planning! 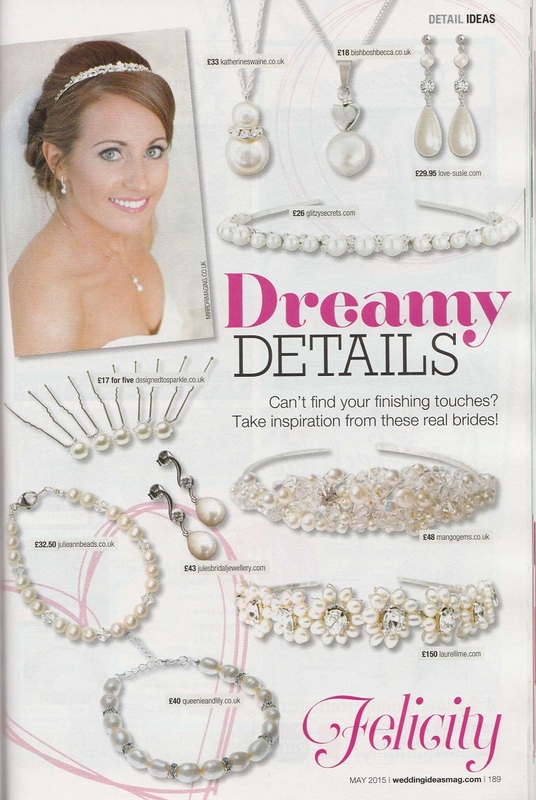 This months issue is no exception - I am delighted with the choice of jewellery that the Wedding Ideas team have made! The May 2015 issue sees real weddings used as the perfect inspiration to create your own wedding day jewellery look! The first look featuring my bridal jewellery is with bride 'Felicity' who looks stunning wearing pearls - a beautiful pearl tiara, lovely delicate pearl drop earrings, and a simple pearl necklace. Wedding Ideas suggests using my Megan bridal pearl hair pins to get a similar look, shown here as a set of 5 pins which gives you a discount of 15%! I also suggest the Callie pearl head band tiara worn with Selene freshwater pearl bridal earrings and Selene freshwater pearl drop necklace. The Selene earrings and necklace are classic freshwater pearl jewellery that will look stunning on your big day and will become a staple in your jewellery box for many years to come. As an alternative for a bride keen to keep a reign on her accessories budget, you could alternatively buy the Inara or Phoebe Swarovski pearl bridal necklaces to give a perfect finishing touch. The next real bride, Jody looks amazing with gorgeous floral inspired accessories. The team chose, the Seren bridal earrings to get Jody's look. These beautiful wedding earrings have a central Swarovski crystal in a flower shaped setting, and are snip at just £22! Another suggestion for flower inspired jewellery from my range is the Calanthia bridal crystal necklace - a simple but very sparkly delicate Swarovski pendant in the shape of a flower. For a sprinkle of flower sparkle and shine in your wedding day hair why not try my Kasi hair pins - either the crystal or pearl pins, or both scatted together. How about buying them in a blue shade to add your 'something blue'! Or for some vintage wedding floral sparkle, try the Freya bridal hair pins. 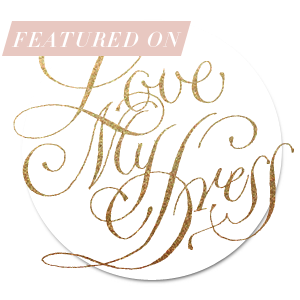 These gorgeous wedding hair pins work very well pinned into a sleek up-do. Or to get real bride Rebecca's vintage glamour look, our Angelique swarovski crystal stud earrings have been chosen in clear crystal. Available in many different colours these earrings will add sparkle and shine to you and your bridesmaids, and priced at just £15 they can add sparkle to your wedding accessories without blowing the budget! My range has many beautiful vintage style hair accessories and wedding jewellery to choose from, including the simply stunning Mai bridal head band tiara. Mounted on a ribbon covered hair band which can be chosen in dark brown or blond, the detail of this stunning hair accessory sits to the side of the head as a side tiara. Or for pure Hollywood sparkle and glamour, why not choose the Laine diamante wave bridal tiara. A true statement piece which is so easy to wear. The 'Theme Ideas' section of Wedding Ideas is again brimming with inspiration for wonderful wedding colour schemes and themes. The 'Mexican Fiesta' theme sees my turquoise Mirabella bridesmaid pearl earrings featured. You could use these lovely large pearl earrings to add a splash of colour for your bridesmaids, or perhaps to add a bridal 'something blue'! This gorgeous, vivid turquoise shade fits well in to celebrate a Summer wedding, or to brighten up an Autumn or Winter wedding by making your guests feel that they have been whisked off to a Mexican Carnival! A great addition to these pearl earrings are the Kerensa, Carys and Amara pearl or crystal bridesmaid bracelets - perhaps stacked up in different striking and bright colours such as coral orange, jade green and turquoise blue! Finally the stunning 'Silver & White' wedding theme is a sea of sophistication and glamour, and showcases the Calanthia Swarovski crystal flower pendant necklace. A beautifully delicate cluster of Swarovski crystals, this sterling silver chain and pendant works equally well as a simple bridal necklace, or as a gorgeous gift for each of your bridesmaids. Another beautiful pendant necklace which also works well is Lucine; a stunning single Swarovski crystal held in a sterling silver setting and hung from a sterling silver chain. And to add the final sparkling finishing touch, try a air of beautiful stud earrings - either the Lucine chaton cut swarovski crystal stud earrings, or again the Angelique Swarovski flat back crystal studs. Both pairs of earrings come in sterling silver settings and will shine brightly on your big day! 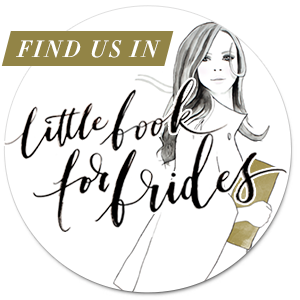 I hope that your journey to find your perfect wedding theme and wedding accessories is filled with fun and delight, as is your big day when it arrives!